Five hundred years ago sailors feared the horizon, believing if you sailed too far you could fall off the edge of the world. Today we smile at such an idea. But back then they were deadly serious; so much so that they erected a monument at the Strait of Gibraltar to commemorate the concept. At its narrowest point Spaniards assembled a huge stone marker bearing the Latin inscription Ne plus ultra, which means ‘No more beyond’. Then in 1492 Christopher Columbus came along and blew their theory out of the water (no pun intended!). The discovery of new worlds and new horizons changed everybody’s mind. Spain even acknowledged this in its coins which came to bear the inscription Plus ultra – ‘More beyond’. Have you limited yourself in your thinking? Do you regret wasting seasons of life on foolish notions and pursuits? Do you feel like your best years are gone by? Not so! You’ll have eternity to make up for lost time in a glorified celestial body that knows no limitations. Your biggest moments lie ahead, on the other side of the grave. So: ‘Set your sights on the realities of heaven, where Christ sits in the place of honour at God’s right hand. Think about the things of heaven’ (vv. 1-2 NLT). John the Revelator was a prisoner, surrounded by the sea on the tiny island of Patmos. Everywhere he went, the sea was there. It confined him. It hemmed him in and separated him from those he loved. Then God showed him the glories of heaven and he wrote, ‘There was no more sea’ (Revelation 21:1 KJV). No more limitations - in heaven you’ll be ‘free at last’. Heavenly Father, Thank you for your Word Today. Thank you for teaching us to set our eyes on the realities of heaven and on you. Lord touch our spirit to trust you always even sometimes we can't understanding what's happening in our life. Lord strengthens us in our daily walk with you and to believed Your Word always that we might not go astray in our present but prepare our life to meet you Lord in eternity. Lord helps us to follow your will and always focus on eternal things rather than temporal things for your glory In Jesus’ Mighty Name. Amen! Max Lucado writes: ‘The journey home is nice, but the journey is not the goal. I prepared part of this message on an airplane. As I looked around at fellow passengers, I saw contented people. Thanks to books, pillows, and crossword puzzles, they passed the time quite nicely. But suppose this announcement were heard: “Ladies and gentlemen, this flight is your final destination. We’ll never land; your home is this plane, so enjoy the journey.” The passengers would become mutineers. We’d take over the cockpit and seek a landing strip. We wouldn’t settle for such an idea. The journey isn’t the destination. The vessel isn’t the goal. Those who are content with nothing more than the joy of the journey are settling for too little satisfaction. Our hearts tell us that there’s more to this life than this life. We, like E.T., lift bent fingers to the sky. 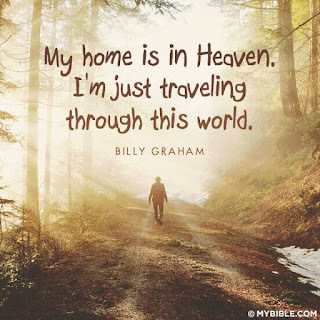 We may not know where to point, but we know not to call the airplane our home.’ Jesus said, ‘I am going there to prepare a place for you.’ And there’s no place on earth like it! So live with heaven in mind. Heavenly Father, Thank you for your Word Today. Lord Your Word today remind us that we have a final place for our destiny and that place we will see you face to face and have close fellowship with you. Lord teaches us to number our days that we may have the heart of wisdom which means Lord we will not passing the days without talking to you and enjoy our fellowship with you while we are on earth so that Lord we can practice our eternal job is to worship You forever in heaven. 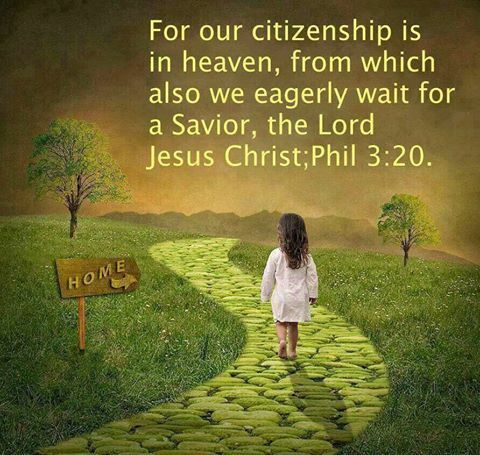 Lord thank you for giving assurance of eternal life and a final place that we live in someday. Lord empowers us to stay faithful to you so that we can be sure of our eternal destination for your glory In Jesus’ Mighty Name. Amen! 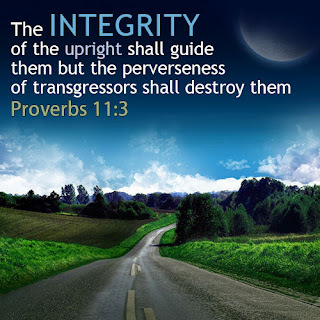 The word integrity derives from the word integer, a mathematical term for a whole number as opposed to a fraction. 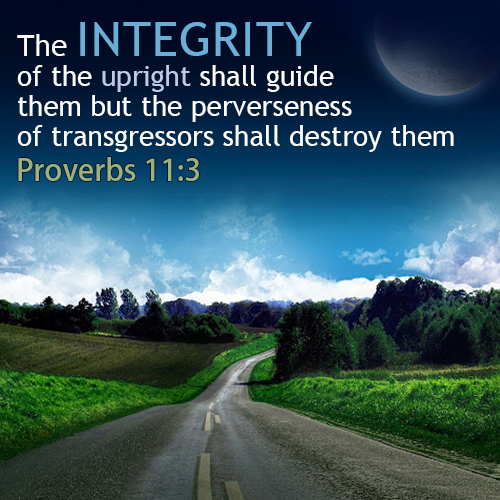 So when you walk in integrity, that means you tell the whole truth and not just a fraction of it. That’s why we take an oath in court to tell ‘the truth, the whole truth and nothing but the truth’. Why do we slant the truth, embellish it, and tell half-truths? Sometimes it’s for financial gain, other times it’s for social advantage. Sometimes it’s to hide our actions, other times it’s to avail ourselves of certain benefits. Jacob, whose name meant ‘trickster’, conspired with his mother and deceived his father into giving him the birthright of the firstborn - twice as much of their father’s inheritance which rightfully belonged to his older brother Esau. And Jacob paid dearly for it. He spent the next fourteen years as a fugitive working for his father-in-law, who was an even bigger and better cheat than Jacob. Finally, in despair, Jacob had an encounter with God and heard these words: ‘I am with you and will watch over you wherever you go…I will not leave you until I have done what I have promised you’ (Genesis 28:15 NIV 2011 Edition). That day Jacob’s value system changed, and the taker became a giver. He told God, ‘Of all that you give me I will give you a tenth’ (v. 22 NIV 2011 Edition). And after that God blessed him beyond his wildest dreams. He returned home after many years with a beautiful family, great riches, and a new name: Israel. The truth is, integrity pays dividends every time. Why? Because God guarantees it. Heavenly Father, Thank you for your Word Today. Thank you for teaching us to always tell the truth and not to hide the things to our personal motive and advantage. Lord I pray that my motive in my life will always to help others and bring them towards you that they may taste the goodness of life and walk the real life with you and we call this real living. Lord whatever happens I will always cling to your Word and to follow your Path today. Lord I believed that trusting your Word is more than Integrity because your Word is Truth. Lord as you knew we live in a fallen world but I will follow you with all my heart is where are safe. Lord strengthens us to speak the Truth for your glory In Jesus’ Mighty Name. Amen! One of the most familiar parables Jesus told illustrates how things work in God’s kingdom: ‘Then he who had received one talent came. 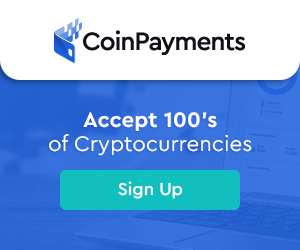 “Master,” he said, “…I was afraid and went out and hid your talent in the ground.”…His master replied, “You wicked, lazy servant!…You should have put my money on deposit with the bankers, so that when I returned I would have received it back with interest. Take the talent from him and give it to the one who has the ten talents. For everyone who has will be given more, and he will have an abundance. Whoever does not have, even what he has will be taken from him …throw that worthless servant outside”’ (vv 24-29 NIV). Can you imagine going to work next Friday and watching your boss hand your pay packet to someone else, while you stand there? That’s exactly what’s going on in this story. It’s a picture of what will happen at the judgment seat of Christ—and you’ll be there to see it. Why did the Lord come down so hard on this guy? Because he buried his talent. And why did he bury it? Because he ‘was afraid’. Afraid of what? a) Afraid the talent God had given him wasn’t equal to the task. b) Afraid to take a risk in case he failed. c) Afraid he didn’t have the talents others had, therefore his didn’t count. Just like there are degrees of punishment in hell (Matthew 11:21-24), there will be degrees of reward in heaven. And how you use your talent now determines what your reward will be then. Heavenly Father, Thank you for your Word Today. Thank you for teaching me to educate myself about investment and to multiply our talent and position. Lord we knew that you teach this topic today to remind your children to be productive and maximize my ability or talents so that I may not waste the time for today. Lord thank you for this wisdom and I believed that you are serious for your children to experience the abundance of life in terms of physical health, spiritual maturity and financial possession. In Jesus’ Mighty Name. Amen! David had just won a string of spectacular military victories. But when he returned from battle and found his home destroyed by the Amalekites and his family taken captive, he was heartsick. He and his men fell to the ground and wept, until they could weep no more. But he didn’t stay down. 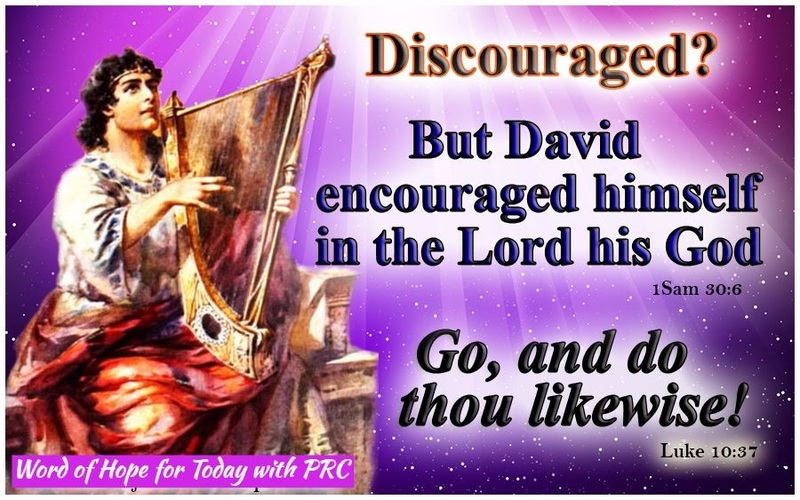 ‘David inquired of the LORD, saying, “Shall I pursue this troop? Shall I overtake them?” And He answered him, “Pursue, for you shall surely overtake them and without fail recover all”’ (v. 8 NKJV). 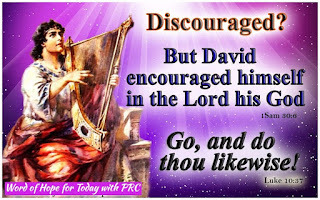 And David’s self-encouragement, coupled with God’s guidance, led him to his next victory. You must learn how to talk to yourself the right way, how to quote God’s promises, and how to pray for yourself. And here’s a promise from the Psalms that you can stand on: ‘Weeping may endure for a night, but joy cometh in the morning’ (Psalm 30:5 KJV). Your joy will return. God has promised it! So look in the mirror today and declare, ‘This too shall pass. What doesn’t destroy me makes me stronger. In the meantime I’ll let this situation drive me closer to You, Lord.’ Come on - start encouraging yourself! The biggest battles bring the biggest victories. Your weaknesses can become discovery points for strengths you never knew you had. 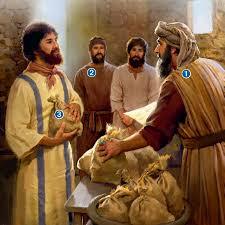 Recalling the worst time in his life, Joseph said, ‘God turned into good what you meant for evil’ (Genesis 50:20 TLB). And He still does that! Other people don’t control your destiny, God does, and He’s not like others. He can turn your pain into gain and your scars into stars! Regroup, refocus, and resolve to press on. The word for you today is: Always encourage yourself. Heavenly Father, Thank you for your Word Today. Thank you for supplying me strength and hope to follow you what it takes. Lord sometimes in our life we see trials or obstacles as stumbling block that we can't go on to move forward in our life but you Oh Lord is my rescuer, my motivator and my strength, my banner and torch and a very present helps in times of troubles. Lord thank you for not leaving us hopeless but encourage us to have full of hope for you are in control of everything. In Jesus’ Mighty Name. Amen!